Supports Natural Testosterone! Immune Function! Restful Sleep! Serious Nutrition Solutions ZMA capsules contain a highly bioavailable from of zinc and magnesium, along with vitamin B6 to help aid in absorption. 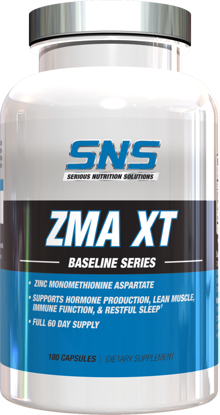 ZMA is commonly used by those looking to help increase free and total testosterone, enhance lean muscle & strength, and promote immune function and restful sleep. - Helping Increase Free & Total Testosterone! - Enhanced Lean Muscle & Strength Gains! SNS ZMA Caps can be taken with SNS Tribulus-750, Bulbine Caps, DAA Caps or Powder, or select other SNS products for improved, synergistic results.